On a crisp spring afternoon my friend and associate Don Kalec and I traveled south to tour a piece of architecture that I had studied yet never visited, the Coonley House in Riverside. 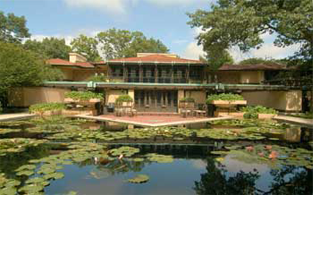 Don was the preservation architect for Frank Lloyd Wright’s Home and Studio and a Fellow at Taliesin in Spring Green. I couldn’t think of a better authority to share the experience of this extraordinary estate. In 1907, the Coonleys met with Wright in his Oak Park office with the intent to build a residence of high distinction. Wright had just completed the Robie House which provided the president for this new suburban estate. The Coonleys were educated and successful in industry and publishing — the perfect combination of appreciating for architecture and deep resources. As Don and I drove through the elegant winding boulevards in Riverside, designed by the famous landscape architect Frederick Law Olmsted, our anticipation grew. The bucolic town nestled on the curving Des Plaines River is an ideal setting for this master architect’s work. Although the original five acre estate was sub-divided, the principal home on a one acre garden is beautifully unified and preserved through careful planning and restoration. The pallet of colors and materials, red tile roofs, copper gutters and trim, ochre tinted stucco walls and geometric patterned tile accent walls establish architectural cohesion while contrasting to the Jens Jensen prairie landscape plan. The entrance sequence is remarkable, a long crushed stone driveway leads to the secluded entry door, filtered natural light illuminates a dramatic flight of steps that cascade down, beaconing one to ascend. The U-shaped stair is crowned by a hip roof perforated by a series of oak grills. Wright’s unconventional planning is apparent here with all the public spaces placed on the second floor to take advantage of the natural light, views and volume ceilings. The living room is anchored by the massive brick fireplace that is flanked by beautifully recreated murals depicting the natural world outside. The Arts & Crafts murals were meticulously researched and hand painted, utilizing historic drawings and black and white photographs. Bands of art glass casement windows and low book shelves articulate and frame the horizontal view to the forest and river. The spaces overlook a very private geometric reflecting pool below. The second floor containing the public spaces is arresting in its integrated beauty. The owners, Ella Mae and Dean Eastman, have researched and restored the original sand plaster walls with three transparent glazes of green, ochre and yellow, re-creating the summer/spring palette. The hip roofs are expressed with panels of oak trim and intricate grills to introduce lighting in patterns. The entire house has been carefully restored with all new mechanical, electrical and plumbing. This house elevates the art of living while providing spaces and details that function for contemporary use. “The space is both tranquil yet energizing, expansive yet intimate and aesthetically rich yet functional,” Mr. Eastman eloquently sums up living in the residence. Don and I were both impressed by the quality of this restoration. This treasure is currently for sale. Garret Eakin is an award winning residential architect residing in Oak Park. He is also an Adjunct Professor of Architecture at the School of the Art Institute and a Historic Preservation Commissioner.